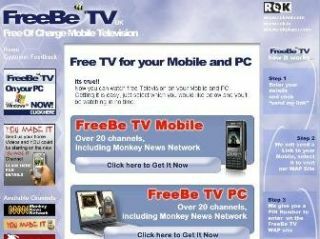 FreeBe TV, claimed to be the world's first free mobile and IPTV offering, has been launched by mobile communications and entertainment company ROK . Users will have access to a 'wide variety' of content for viewing on WAP-enabled mobile phones (using any carrier) wherever they are in the world, as long as it is in an area with 2.5g GPRS coverage. Users will have to pay network data charges on the content they download, if it's not bundled with a contract. Content can be watched on a PC free of charge, and can also be minimised to be viewed in quarter screen size. There's no need to open an internet browser or type in a web address each time you wish to access the service - it's effectively a TV on a PC. ROK believes that consumers will only adapt to IPTV if content is free, and wants to strip away consumer reluctance to embrace such services. "This is a major step forward in the convergence of TV, mobile and internet, and works towards delivering the consumer's holy grail - that being the content of their choosing delivered on their terms, in terms of location and time", said Jonathan Kendrick of ROK. FreeBe TV currently offers 20 channels, including live news, music and sports, but ROK aims for FreeBe TV to offer close to 500 channels, on-demand and segmented by language and genre.